People Food That Is Bad For Your Dog - Some can cause illness or death. There is a lot of people food that is bad for your dog! We spend billions of dollars every year to feed our pets. As loving dog owners we buy the best dry and canned foods available. But it seems like most of our pets would much rather eat people food. Veterinarians say that it can be very dangerous to pets and may cause illness. In some case it will even death. This is because some foods are toxic due to ingredients they contain. Others can be very dangerous because of improper cooking, storage or poor hygiene. Alcoholic beverages contain Ethanol. When an excessive amount is ingested it can be toxic. Because pets are much smaller than humans they can be affected by only a small amount of alcohol. Other than the odor of alcohol on the animal’s breath there are signs that they have ingested alcohol. They are, staggering, behavioral changes, excitement, depression, increased urination, slowed respiratory rate or cardiac arrest. Contact your local pet hospital at once if these symptoms are present. Sickness or death may result if not treated. Large amounts of stems, seeds and leaves of these fruits can be toxic to dogs. Signs of sickness are apprehension, dilated pupils, difficulty breathing, hyperventilation or shock. Avocado’s contain “persin,” which is a fatty acid derivative in the leaves and in the fruit. There are many possible symptoms that your dog may show after eating an avocado. They include difficulty breathing, abdominal enlargement due to fluid accumulations in the chest, abdomen and the sac around the heart. Even small amounts can cause problems. Never feed your pet any component of the avocado. Baking soda and baking powder are leavening agents used in baked goods. They produce a gas that makes batters and dough rise. Baking soda is sodium bicarbonate. Baking powder is baking soda mixed with cream of tartar, calcium acid phosphate, sodium aluminum sulfate or a mixture of all three. Ingestion of large amounts can lead to low potassium, low calcium and/or high sodium levels. Congestive heart failure or muscle spasms can also occur. Chocolate contains caffeine and theobromine. Both are nervous system stimulants. Both can be toxic to your dog in large amounts. The amount of caffeine and theobromine will be different in different types of chocolate. White chocolate has the lowest concentration. Bakers chocolate or cacao beans have the highest. Depending on the amount eaten, various problems may occur. They can including vomiting and diarrhea. You will also notice restlessness, hyperactivity, muscle twitching, increased urination and excessive panting. Fatal or near fatal amounts will cause accelerated heart rate and blood pressure levels. Seizures may occur in severe cases. Although it is not actually toxic to dogs it is probably best to avoid Cinnamon. It can irritate a dogs mouth and can make them uncomfortable and even sick. Cinnamon can also lower a dog’s blood sugar. It can also give a dog diarrhea, lead to vomiting, increased, or decreased heart rate, and even liver disease. If they inhale it in a powder form, cinnamon can cause difficulty breathing, coughing, and choking. Coffee contains caffeine. The symptoms are the same as chocolate. They can be just as serious. Rich and fatty foods are just as tempting for dogs as they are for humans. Foods that are high in fat can cause Pancreatitis. Pancreatitis can affect any pet. Miniature breeds are particularly prone to this disease. Signs include acute vomiting, diarrhea and abdominal pain. Dog can become very sick very quickly. Intensive fluid and antibiotic therapy by a Veterinarian is needed at once. Dairy products in general are not highly dangerous but they can be high in fat. Pets also do not digest dairy products because they lack the enzyme required to digest lactose. This affects some pets more than others. The affects can range from gas problems to diarrhea. Small amounts of plain yogurt or cheese are tolerated by most dogs but it is best avoid dairy products altogether. Eating grapes or raisins can cause kidney failure in dogs. Aggressive treatment is necessary to give an affected dog a chance of survival. Without treatment death is possible. Contact your veterinarian immediately if your dog has eaten grapes and raisins. Macadamia nuts, are highly toxic to dogs. It has been determined that as few as six nuts have caused severe toxic reactions. These reactions include weakness, depression, vomiting, difficulty walking, tremors, abdominal pain, lameness, stiffness or pale gums. These signs can dissipate in 12 to 36 hours. Dogs lack the natural enzyme necessary to digest onions. Results of eating them include gas, vomiting, diarrhea or severe intestinal pain. If large amounts of onion or garlic are ingested the red blood cells may become fragile and can break apart. This is due to the toxic ingredient thiosulphate. Signs can begin immediately noticed after eating the onion or within a few days. Large quantities of garlic would need to be ingested before signs are seen. Death can occur if the dog eat a lot of onions or garlic and do not medical treatment. High levels of nutmeg can be toxic or even fatal. Signs of toxicity include tremors, seizures, nervous system abnormalities or death. 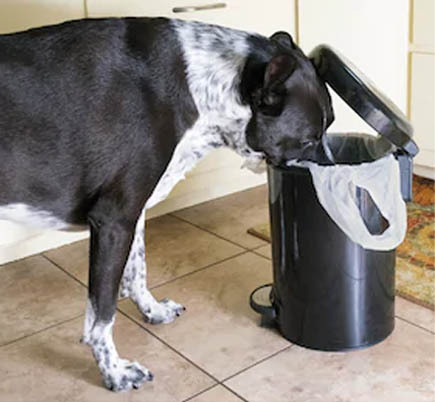 Serious medical problems can arise when dogs get into the trash containing moldy or spoiled food. In addition to the threat of food poisoning, some pets develop tremors related to the ingestion of certain molds. In conclusion, feeding your dog human food of any sort carries some degree of risk. Therefore it is our advice that you use great caution if you decide to give your dog human food. If you think your dog has eaten something that could be dangerous or if you have giving your dog something that has made it sick call the ASPCA Animal Poison Control Center.